GoldShield Care is the perfect way to save on your annual park home maintenance and repair bills. If you're covered by our market-leading GoldShield warranty scheme, it will also ensure your residence meets all the necessary requirements if you ever need to make a claim. To learn more about this, make sure you read our guide to park home maintenance and meeting your warranty obligations. 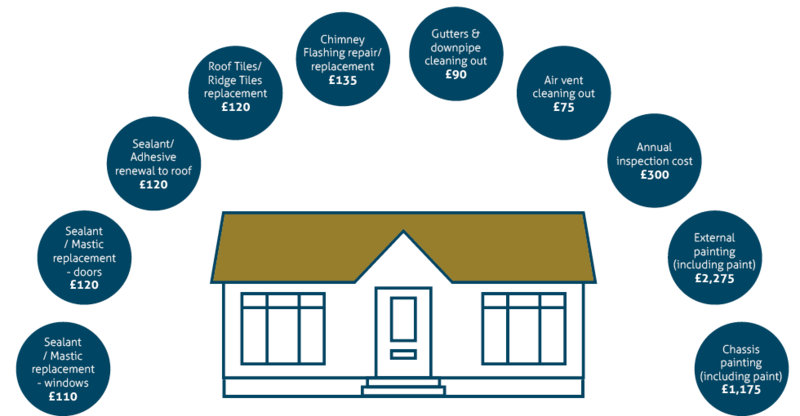 Take a look at our pricing chart* below to see how much you could save each year on park home refurbishment with GoldShield Care, Care Plus, Total Care, or Canexel Care. Your Goldshield Warranty gives you protection against inherent defects for up to 10 years. You should examine the exterior walls for hairline cracks due to the natural shrinkage of the exterior cladding. Failure to comply with these maintenance obligations in all respects may render your warranty invalid. GoldShield Care, GoldShield Care Plus, GoldShield Total Care and GoldShield Canexel Care give you peace of mind that you are adhering to the stipulations of your warranty. Call us now on 0191 258 8170 to find out more.